June 6, 1944 – The Morning of the Invasion we were woke up at 12:20 a.m., ate breakfast, had a short briefing, put our guns in our plane (297), took off about 4:40 & left the coast just as it was getting daylight at 15,000 feet. We bombed Ansalles with 12 – 500-pound bombs and returned by around 10 a.m. Was briefed [crossed out] interrogated, ate dinner & went to sleep for close 1 ½ hours. Was called out in the afternoon & took off at close 6 p.m. on about the same course & bombed Caen at 15,000 feet with 12 – 500-pound bombs & returned to base at 11:30 p.m. We were interrogated, ate a short meal & got to bed about 1:15 a.m.
June 7, 1944 – We slept till about noon & cleaned up our guns & planes in the afternoon & was to be ready to go on another mission if we were called. The first day was too cloudy & we couldn’t see ships in the Channel & saw a few battleships firing at the coast. June 8, 1944 – We were woke up at 2:10 a.m., ate breakfast, had a short separate briefing & was ready to take off at 5:30 a.m. with 12 – 500-pound bombs (all demolition) and went on almost the same course as on 6th, only at 20,000 feet. Today we could see a lot more. Just a few scattered clouds & about 10 times as many ships in the Channel as compared to the 6th. We saw more troops & convoys & we could see heavy bombers all around us as we did the first day. We went farther into France to an air field at Rennes. The clouds were getting thicker & by the time we got to our target it was covered with clouds & we could not see it to bomb so we made 2 runs at the target, but failed. We had light flack at the target & returned to our base in England & landed at about 11:00 with our 12 bombs. We came in, ate dinner & came back to the barracks. Went to sleep & was woke up at 4 p.m. to clean our guns and ships & was through for the day. This made my 8th mission. June 11, 1944 – We were woke up about 1 a.m. & took off before daylight & went into Caen, southwest of Paris. We couldn’t see any of the Channel or any of France so we had to return with our bombs & it was awful cloudy the whole trip. June 12, 1944 – We were woke up at 1 a.m. again & ate at 1:30 & took off right after daylight & things were pretty well cleared off for a change. We had 18 – 250-pound bombs & went to Cambrai [?] north of Paris & hit the runways of a large airfield at Cambrai. The target was real clear & we were at 22,000 feet. I had a pair of binoculars & saw the bombs hit & done a fine job. We returned to the field with no losses. There was medium flack. This was my 10th mission. June 13, 1944 – We were woke up at 12:15, went to eat breakfast & before we were done eating, the mission was called off, so we slept till 9 a.m. & cleaned up the plane in the afternoon. June 14, 1944 – Woke up again at 12:15 & ate breakfast. Got our planes ready & took off at 4:50 a.m. with 38 – 100-pound bombs & bombed at 22,000 feet. We went to Paris [space] (airfield). I saw the bombs hit & done a good job. We were attacked by Mc109 (3 or 4) but did no damage & had medium flack & was pretty accurate. Mission lasted 6 hours, 15 minutes. June 15, 1944 – We was woke up at 12:30, ate breakfast & took off around 6 a.m. with 12 – 500-pound bombs. The weather was pretty good & we bombed a bridge at Mantes, France. We hit the target & went through heavy flack & got about a dozen holes in the plane (297) & on our way back we were attacked by 3 or 4 Mc109 but never hit any of our planes & we didn’t even get a shot at them & late on 2 B-17 planes were circling us & looked very strange & my pilot told us to give him a few shots & I did & then he left our formation. We returned about 10:30 all safe. June 17, 1944 – Woke up at 1 a.m. Breakfast at 2. The gunners had no briefing & went straight to the ships from breakfast to get them ready for a quick takeoff & about 2 o’clock the mission was cancelled. We left the guns in the plane & put our clothes away & got to bed a little after 4 a.m. & then at 8 a.m. we were called out & went to our ship without eating & right before we were to take off, they assigned us to another plane (153) & then we flew as spares & turned around when we got to the French coast & landed at our airfield close 12:30 p.m.
June 18, 1944 – We got up at 12:15, [had] breakfast at 1 & took off at 4:30 a.m. We had 18 – 250-pound bombs & went to Hamburg, Germany at 26,000 feet. It was about 7/10 clouds & we didn’t drop our bombs. There was pretty heavy flack & no fighters. We lost no planes in our squadron & landed at our field at 12:12 p.m.
June 19, 1944 – Woke up at 3:00 a.m. [in] the morning & took off at 6:30 with 38 – 100-pound bombs & went to bomb rocket installations on the French coast. It was too cloudy so we reurned with the bombs & had no opposition at all. We landed at 11 a.m. & had to stand by all afternoon but didn’t need to go. We had to use another plane (198) because ours had something go wrong [at] the last minute. June 20, 1944 – We were woke up around 1 a.m., ate breakfast & took off early & flew at 23,000 feet & went to Hamburg & bombed the oil supply with no losses. June 21, 1944 – We were woke up at 12:15 & took off at 4:40 in the rain with 6 – 500-pounds of clusters tk 6 [?] bombs were boogy traps. This time we flew at 27,000 feet & bombed Berlin with no losses in our squadron, but I saw 2 planes go down & explode. The flack was real heavy & had a close shave in the contrails over Berlin. We had a few holes in our plane & 2 cables shot off. Today we still saw Hamburg burning & smoking as bad as we left it the day before. This was a 10-hour mission & most of the planes returned with little or no gas & some planes had to ditch from other squadrons. June 22, 1944 – We took off at 4 p.m. with 12 – 500-pound [bombs]. We flew at 25,000 feet & bombed the marshalling yards in Belgium. We had no fighters or flack & it was a short raid of 5 ½ hours. June 23, 1944 – We stood by but the mission was scrubbed [at] the last minute. June 24, 1944 – We woke up around 4:15 & took off at close 9 a.m. & had 12 – 500-pound bombs & went to Bremen, Germany & bombed through clouds & had a good bit of flack but no trouble. We flew at 23,000 feet. This was a 9 ½ hour mission. June 25, 1944 – This was an afternoon mission. We took off around 4:30 p.m. with 2 – 2,000-pound bombs & went at 20,000 feet to Jargny [? ], France to bomb a bridge. We had no flack at the target & a little on our way back. We landed around 10:30 p.m. & got to bed around 12 [midnight]. June 26, 1944 – We were woke up at 12:15 a.m., had a short briefing on a long mission & we got our ships ready & then as we started to taxi at 4:30, the mission was scrubbed. July 7, 1944 – We were woke up around 1 o’clock and as usual had a short briefing & took off around 5:30 & it was still a little dark. We had, for the first time, our own crew of 9 men. 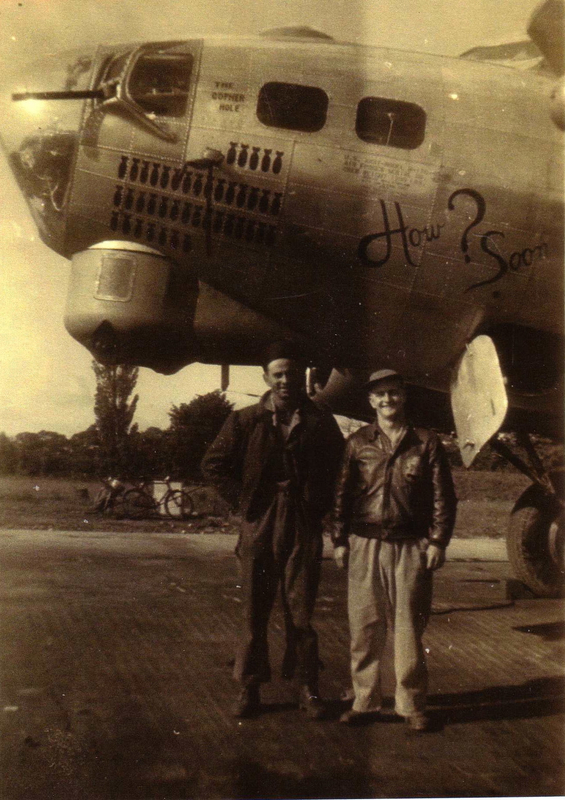 We had 10 – 500-pound bombs & went to Leipzig at 24,000 feet & was south of Berlin. It was pretty heavy flack but no damage to us. We were flying for 8 hours & 35 minutes. July 11, 1944 – We were woke up around 4:00 & took off at 8 o’clock with 18 – 250-pound bombs & flew at 26,000 feet to Munchen & bombed the city. Because of weather conditions, we missed the city & didn’t get in the flack, but there was plenty of it over the city & we saw plenty on our way back but didn’t get any holes or see any fighters. It took 9 ½ hours. July 16, 1944 – We got up early Sunday morning & took off around 6 & bombed Munchen with 10 – 500-pound bombs at 28,000 feet. The target was 10/10 clouds & vapor trails were very bad. There was a good bit of flack but none bad or close on our way back. Over England we had a close shave in formation at low altitude, but made it home & all O.K. July 17, 1944 – We left on flack [?] leave to Stratford-on-Avon & came back on the 21st. We had a swell time. July 24, 1944 – We were woke up at 2 a.m. & almost all of the fellows were called out. We were briefed at 3 a.m. & was to take off at 6:30 but it was changed to 10:30. We had 38 – 100-pound bombs & bombed the front lines in France. The target was clear & the way home was solid with clouds. It took 5 hours & we met a formation of [B] 24’s & had to sift through them but wasn’t so close. We bombed at 15,000 feet & had a little flack, but not close [to]us. July 25, 1944 – This time we were woke up about 3:45 for 4 a.m. breakfast & 5 a.m. briefing & took off at 8:30. Again we bombed the front lines in France & at 12,000 feet with 38 – 100-pound bombs. Our target was clear & we hit the right place with no flack & no fighters. This was another 5 hour raid and the lowest we ever bombed anything. July 28, 1944 – We were woke up around 2 o’clock & took off at 6:30 with 1- = 500-pound bombs & flew at 23,000 feet to Museberg [?] & bombed the synthetic oil plants. There was a lot of flack but it wasn’t accurate so we came back without any trouble. This time we saw dog fights in the wing behind us & I saw one fighter going straight down in smoke. July 31, 1944 – We were woke up at around 3 o’clock & our crew was ground spares. So we ate breakfast & went out to our ship (297) & put the guns [?]. After we put the guns in we had to standby in our combat room til the crews took off & about 40 minutes before they took off I was called out to take the place of a ball gunner that got his nose broke in an accident while working on the turret. It was plane (896). We went to Munich with 10 – 500-pound bombs at close 24,000 feet. We were in the first wing for the first time & was led by the General. There s a good bit of flack but we only had 3 or 4 holes in the plane. Was 9 ½ hours. Aug. 3, 1944 – They got us out at 6:30. 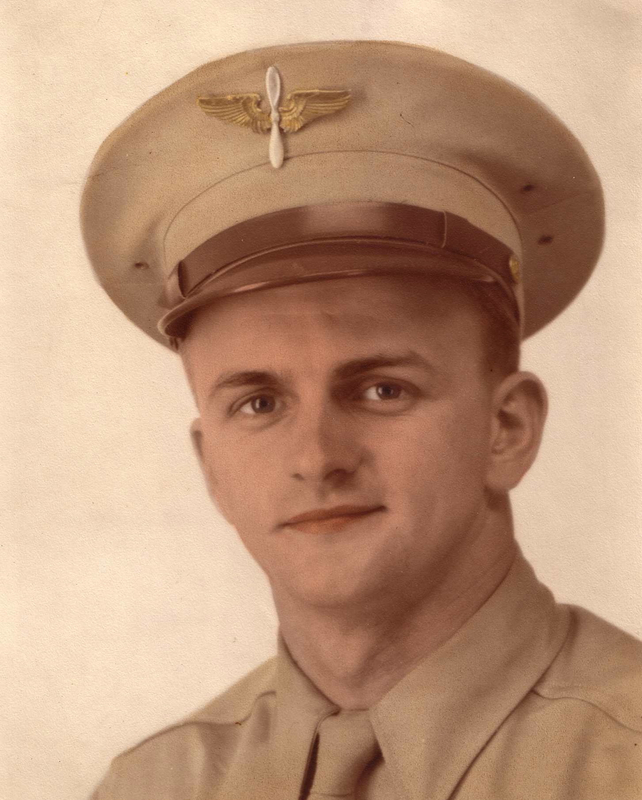 Ate at 7 & briefed at 8:00 & took off at 11:00 with 20 – 250-pound bombs. We bombed Merckeweller in France, close the German border. We had little flack on our way to the target but none at the target or on the way back. We bombed at 20,000 feet & was in the air around 7 hours. Aug. 7, 1944 – Woke up at 3 a.m., breakfast at 330, briefing 4:30 & took off at 9:30 in fog. We went to Montauban, S-W France & 70 miles from Spain. Took 8 hours. We had 5 – 1,000-pound bombs. Had light flack as we crossed the coast. We hit a petrol supply & didn’t do any damage. Flew 301 plane. Aug. 8, 1944 – Jack Lawlor went down. Aug. 9, 1944 – We were woke up around 3:30 & ate & briefed as usual & took off around 6:30 a.m. with a full gas load to Ulm with 10 – 500-pound bombs & flew at 25,000 feet. We only saw a few bursts of flack & had no hits. It was 9 hour trip. We used plane 143. Aug. 12, 1944 – Woke up again as usual at 2:15. Ate breakfast & had briefing & took off at close 6:35 with 38 – 100-pound bombs & went to an airfield northeast of Paris with 2400 gallon. We had no flack & it took 7 ½ hours. We put the 37th mission on our plane 297. Portnoy finished today 32 missions.